Together with a focus on socioeconomic development, the Party Committee and the People’s Committee of Son Tay town (Hanoi city) have always attached great importance to leading and directing the implementation of the military and defence tasks, thereby creating a favourable environment for its rapid and sustainable development. Son Tay holds an important position in Hanoi’s strategy for socioeconomic development and defence and security. During its process of building and development, the Party Committee and the People’s Committee of the Town have always successfully performed its military and defence tasks and achieved positive results. To successfully carry out the military and defence tasks, first and foremost, the Town has focused on raising people’s awareness of goal and direction on Homeland protection specified in the Resolution of the Party Central Committee’s 8th Plenum (11th tenure) on “Strategy to defend the Homeland in the new situation”, the Politburo’s Resolution 28-NQ/TW (10th tenure) on making provinces and Central cities strong defensive zones, the Resolution of Hanoi’s 16th Party Congress, the Program 05-CTr/TU of Hanoi’s Party Committee on “strengthening defence and security and maintaining social order and safety in the 2016-2020 period” as well as its Directive 13-CT/TU on leading the military and defence task in 2017. The Town’s Party Committee has issued the Plan to implement the Politburo’s Resolution No.28 (10th tenure) on continuing to build defensive zones and other directives on military and defence tasks. On the basis of those resolutions and directives, party committees and organization under the Town’s Party Committee have released resolutions and made action plans. The work of defence and security education has been conducted regularly and effectively by the Town. It has been active in innovating content, method and form of education and dissemination of defence and security knowledge as well as law education in accordance with the characteristics of groups of people and each area. The Council for defence and security education has been regularly consolidated and effectively promoted its role. 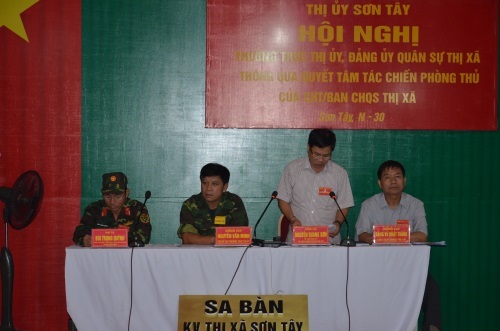 Between 2012 and 2016, the Town sent 8 cadres of group 2 to attend the training courses for defence and security knowledge held by superior authority and launched 40 training courses for 7,017 cadres of groups 3 and 4, 28,708 cadres, party members, officials, teachers, organization members, young people, and 136,217 students, contributing to raising these people’s awareness of the implementation of the military and defence tasks in the new situation. Great importance has been attached to state management of defence, defence work and land, and the building of strong defensive zone. To this end, the Town has promoted the role of its Military Command in cooperating with sectors and authorities at levels on counselling and building defensive zone’s potential. In addition to the planning of military posture, it has step by step executed projects and works serving people’s daily life and the military and defence tasks, while supplementing and completing resolution and projects for defensive operation. Plans for developing the militia and self-defence force; building, mobilizing and receiving the reserve force; reserving and mobilizing force, materials, equipment, particularly force and means to deal with the situations, have been drawn up carefully. In 2016, the Town’s Party Committee and People’s Committee successfully held town-level defensive zone exercise and directed 15 communes and wards to hold defensive zone exercise at their level in tandem with examination of people’s air defence operation capacity, thereby greatly contributing to improving party committees and authorities’ capabilities of leadership, direction, operation, coordination and implementation as well as local armed forces’ capabilities of command and combat readiness. Besides, due attention has been paid to working with units stationed in the area to perform the tasks of maintaining security and traffic safety and mass mobilization, maintain groups of security and safety, and protect political security and social order. Annually, the Town signs cooperation documents with 100% of Army units stationed in the area on natural disaster prevention and management, search and rescue. At the same time, it has worked with those units to mobilize forces to maintain security and safety for the units and the area on the occasions of national holiday, Tet holiday and significant political events; to organize inter-sector squads (police and military) to maintain Army discipline, State law and traffic safety; to carry out the missions of natural disaster prevention and control, search and rescue; to execute the activities of “Repaying gratitude” and military rear policy. In 2016, in the area, 6 forest fires and 1 case of inundation caused by rainfall and storm were opportunely handled on a way that guaranteed safety for life and assets of the people and the State. Army units built around 7 new houses of gratitude, repaired about 20 houses of gratitude, gave presents to more than 2,000 beneficiaries, and contributed thousands of workdays to repairing cemeteries of martyrs, village roads and so on. Quarterly and at the end of the year, the Town holds conferences to draw on lessons and review gained results and weaknesses. Accordingly, this work has been maintained strictly and obtained practical results, greatly contributing to the building of strong all people’s national defence and people’s security in the area of the Town. The Town has regarded the building of strong local armed forces and military agencies as a basic, central task. The Town’s Party Committee has concentrated on leadership over the innovation and improvement of the armed forces’ synergy, especially in terms of politics. To this end, it has stepped up the implementation of the Project to innovate the work of political education in units in the new period in tandem with that of the “Determined to Win” Emulation Movement, the Resolution of the Party Central Committee’s 4th Plenum (12th tenure) on Party building and rectification, the 12th Politburo’s Directive 05-CT/TW on acceleration of studying and following Ho Chi Minh’s thought, ethics and lifestyle, and the Campaign “Promoting tradition, devoting talent, deserving to be Uncle Ho’s soldiers”. As a result, that has contributed to building good image of “Capital’s Soldiers” and making them politically strong, morally pure, proficient in combat readiness and closely connected with the people. At the same time, it has attached great importance to building cadre staff, combining the work of personnel planning, training and use with the work of new party member admission on the basis that guarantees proper structure, high quality and good performance of military and defence tasks of the Town’s armed forces cadres. The militia and self-defence force of the Town has been made “strong, extensive” and closely managed under the procedure: registration of service age, selection, admission, acknowledgement of annual militia and self-defence service fulfilment. The Town has focused on building active militia and self-defence force and those in enterprises to satisfy the preset goals and requirements. The reserve force has been organized according to the Ordinance. Annually, it has successfully conducted the work of managing, training and disposing the reservists in the reserve units. Up to now, the Town’s militia and self-defence troops has accounted for 1.62% of its population; the percentage of reservists disposed in the reserve units have been 98.75%. Great importance has been attached to the work of military conscription and recruitment of military students in accordance with steps, such as propagation, registration, health check-up, vocational orientation, guidance of procedures, and so forth. Between 2012 and 2017, the Town completed 100% of targets set for military conscription in a safe, public and democratic manner, while supporting 845 high school students in registration for military colleges; there were 104 ones passing the entrance exam to military colleges. Due attention has been paid to the work of training forces and means, particularly training the levels and capabilities of operation for the active and subordinated ones. As for the active forces, the Town has followed the direction of “basic, practical, strong” training; as for the militia and self-defence force and the reserve force, it has provided “basic, practical, qualitative” training, which has been grasped and made relevant to reality, opponents and existing equipment. Yearly, the Town’s armed forces successfully fulfil training programs and plans with over 96% of the strength. The Town has directed its military agency to strictly maintain daily, weekly and yearly regulations, especially those on combat readiness, commander duty and duty, etc. It has also directed its military agency to innovate content and form of the party, political work and step up this work in the tasks, such as recruitment, training, exercise, combat readiness, force mobilization, building strong areas; to improve material and spiritual life of cadres and troops and to successfully implement the military rear policy, thereby making a drastic change in troops’ political will, morality, observance of discipline and regularity building. In the face of increasingly higher requirements of the tasks of building strong areas and defensive zones, the Party Committee, authorities, people and armed forces of Son Tay town will continue to promote the tradition of a “People’s Armed Forces Heroic Unit” to successfully perform the military and defence tasks, contributing to building a rich, resilient, revolutionary town in the new situation.